The quality of the air you breathe is highly important to the overall health of you and your family. One of the main ways germs and allergens spread is through air travel which makes having cleaner air in your home important to stop the spread of these harmful contaminants. Installing an air purifier, such as Carriers Infinity Air Purifier, has many healthy advantages for those who suffer from allergies and asthma. They capture and kill dust, pollen, mold spores that can be floating in the air your breathe in your own home. 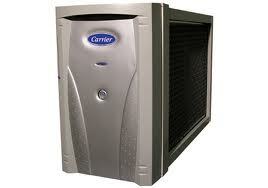 If there are small children in your home air purifiers are highly recommend. Children’s immune systems are still in development and aren’t as strong as adults. Exposing them to contaminated air can result in more illnesses to the child and future health problems as adults; for example, if secondhand smoke is present in the home it can cause young children to develop asthma. Air purifiers remove smoke particles from the air and make it healthier for everyone in the household to breathe.